Social networking sites are becoming a favorite spot for promoting products and services due to the wide and free coverage they offer. There is no better way of reaching out to the masses all over the world for promoting a product and getting instant feedback on your efforts. Owing to the mass appeal of such sites, Facebook is all set to launch a gifts and collection feature, which will encourage users to use the site as a means of gifting stuff to friends and family in addition to letting the world know what they like. The first to be launched would be the gifts feature, which is specially designed to make it possible for users to gift products to their friends while Facebook gets to squeeze out some amount from the gift price. Facebook has gone a step beyond online advertizing and is all set to deal in the sale and purchase of physical products. Gifting via Facebook would be a unique and innovative form of e-commerce that would not require any mailing address. Recipient can fill out the address where he/she wants to receive the product on their own. Even though the recipients will not be shown the cost of the product, Gifts feature will allow them to choose the size, color and other details of the products that they would like to have even before you make payment for it. 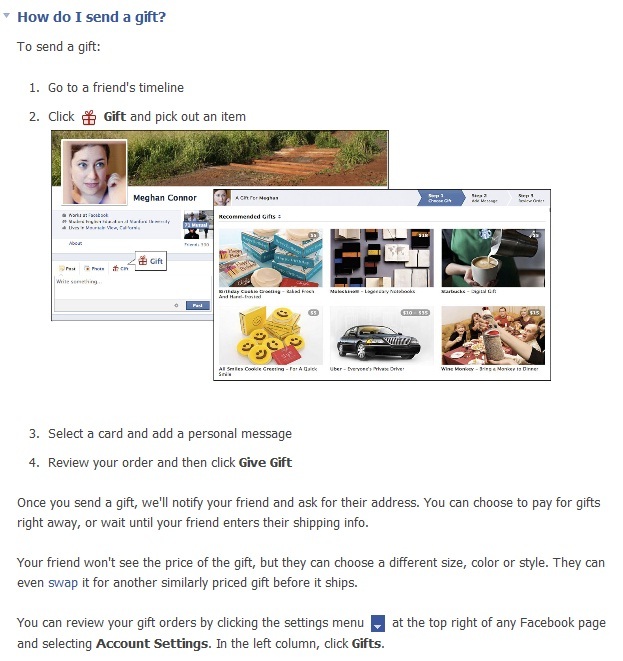 Below is a screenshot of steps to order a gift as provided by Facebook. Another unique feature that was recently tested by facebook and is to be rolled out in near future is “Collections”. Collections Feature will allow merchants to post products on their business page and let users to “want”, “collect”, or “like” a product. A product that is “liked” or “collected” is to be put on a new Timeline feature known as “products” thus showing the products you fancy to your friends. With Collections, the users can add items they wish to own from specific retailers on their wish list. The Collections feature will be a good selling medium for online retailers as they will be able to interact with customers on Facebook which will be helpful in generating potential sales. Even though e-commerce through social networking sites is a new concept, chances are it will pick up amongst people. Social shopping will soon be the new norm where socializing and shopping will go hand in hand. The gifts and collections feature on Facebook will give an exciting twist to e-commerce that is sure to appeal to modern day retailers and consumers.